The British Universal Carrier—often incorrectly referred to as the 'Bren Gun Carrier'—was a WWII vechile used by every Allied army in every theater. Designated by the Army as Carrier Machine Gun Number 1 Mark 1, it was rapidly followed by a new version the Carrier Machine Gun Number 2 Mark 1 which weighed in at 4.5 tons, was 12 feet long, 7 feet wide, and 5 feet high. Like the former model, the latter did not have seats on the track guards, but a small compartment, protected by a raised outer hull plate, created on the left side for a third crew member. Thus there was a driver, sitting front right, the machine-gunner to his left and the third man behind him. The machine-gun mounting came with an extra shield. The Mark 2 had an enlarged gunner’s compartment at the front so that it stood out like an angular bay on to the glacis plate. This configuration made it easier for the gunner to handle his weapon, and with the raised upper section, increased his protection. The armor of the Mark 2 was increased to 12mm thickness; its engine, a Ford V8 90 degree L Head generated 95 hp with a top speed of 30mph. It had a four speed transmission with a maximum range of 140 miles and held 20 gallons of fuel. Its maximum recommended payload was 660 pounds. The Mark 2’s modifications seem to indicate the intention was that the vehicle was to carry and fight its weapons (a Bren Gun, and anti-tank rifle) from the carrier. Within a year over 1,100 of these were built under an Army contract. In 1935 the British Army adopted a new light machinegun—the .303 Bren Gun—to replace its venerable Lewis Gun. The new automatic firearm, based on a Czech design and weighing 28 pounds, was distributed to the infantry down to platoon level. From 1937 onward, the Universal Carrier was adapted to carry the Bren Gun. By 1940 the popular and unofficial name for the Universal Carrier—”Bren Gun Carrier”—the War Office supplied ten such vehicles to each infantry battalion. The crew of each Bren Gun Carrier consisted of three or four men: a driver, and two or three others who formed the Bren Gun Detachment. One carrier section also sported Boys anti-tank rifles. (It should be noted that each infantry section of a rifle company contained a Bren Gun, so these weapons were not exclusive to the Carrier Platoon). Platoon strategy placed emphasis on employing the Bren Gun dismounted from the carrier, and stressed that the gun detachment had to dismount quickly to permit the carrier to withdraw to a safe place rapidly; the driver was never to leave the vehicle. Early models allowed firing from the vehicle, which had a special bracket attached to the front mounting of the machine gun and a crutch supporting the rear end. On later models the Bren Gun was not physically attached to the vehicle, merely resting on a rubber block in the weapon slot and held in place by the operator. The start of the Second World War saw over 2,275 Universal carriers, or “Bren Gun Carriers”, in service. Many of these saw action in France in 1940, and the Middle East. By the end of 1942 a further 6,000 had rolled off the production line. That same year saw an improved version of the Universal Carrier manufactured: the Mark II. The British built 11,000 of these during the war. This new model carried a crew of four. The main difference between this and the model Number 1 Mark 1 was that the front quarter of the top rack run was totally enclosed by a valance, and increased wielding in the hull assembly made it waterproof. Construction of the Universal Carrier was done in the United Kingdom and to a lesser extent in Canada by the Ford Motor Company. The United States did not manufacture any since U.S. law allowed American factories only to produce weapon types normally used by the U.S. armed forces. As the war progressed, Allied command found wider uses for the Universal Carrier. 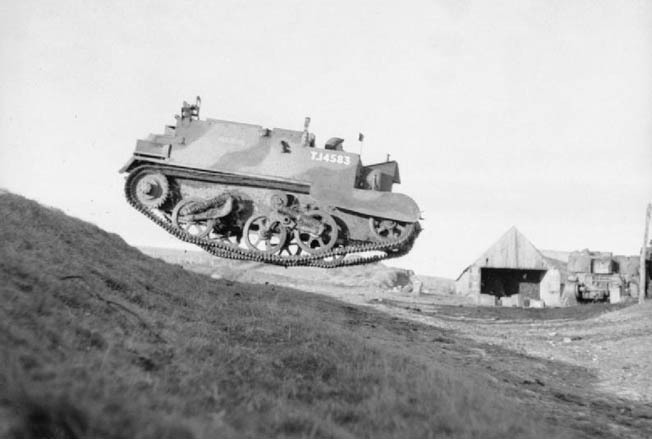 British motorized battalions—units comprising a British infantry brigade, in an armored division—used carriers in their Scout Platoons for reconnaissance missions from 1944 onward. After 1941 carriers began to tot 3” mortars, 66 rounds of high explosive and smoke shells. The mortar and its five-man crew would deploy the weapon outside the carrier. In 1943, British infantry divisions were reconfigured to include a Brigade Support Group. Thirty Universal Carriers were assigned to each such unit to lend additional firepower to the division in the form of medium machine guns (Vickers), 4.2” mortar, and 20mm anti-aircraft cannon fire. When World War Two ended, there remained vast numbers of Universal Carriers in existence. (Over one hundred thousand had been made since 1936). Although now obsolete, many remained in active service in various armies—British, Irish, German, Danish, Egyptian, and Israeli—until the 1960s. Tags Allies, Bren Gun, Bren Gun Carrier, British Universal Carrier, cannon, Egypt, France, Mark V, Model T, Mortar, United States, weapons, wwii vehicles. Good information. Didn’t know this. I ‘ve always wanted one of these. These would have done a great job at Omaha Beach on D-Day. Imagine one of these leading the disembarking of troops from Higgins boats. Well Arnold, this is just another misleading, inaccurate article about carriers. Just disappointing. Feel free to send me an email and I can go though details with you.